Andreas Brandner has been Managing Director of KM-A Knowledge Management Associates GmbH since 2001 and a KM-pioneer in Europe, providing educational, advisory, research and innovation services to international customers. Dr. Brandner brings deep experience with more than 18 years of work in the field of consulting, training and research in relation to knowledge management and policies of knowledge. In 2002 he established the Knowledge Management Academy, which provides International Certification Courses in Knowledge Management with the highest level of expertise. Andreas Brandner has been director and trainer at the KM Academy ever since. Andreas Brandner initiated and co-founded the forum “Platform Knowledge Management”, as well as the knowledge partnership of Austria (“Wissenspartnerschaft Österreich”). He also initiated the first Conference for Knowledge Management and Knowledge Politics in Europe and many other ground-breaking movements in the European Knowledge Society. 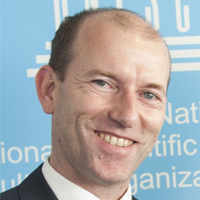 He provided Knowledge Management Consultancy to more than 100 companies, including public administration and international organizations like the UNIDO, IAEA, OSCE, GIZ and many others. Since April 2017 he is also Founder and Managing Director of the Knowledge for Development Partnership, a global multi-stakeholder platform for Knowledge Management supporting the Sustainable Development Goals of the United Nations. He is author of books and articles in the field of Knowledge Management and teaches Knowledge Management at several universities. His most recent publication is the Agenda Knowledge for Development including the global Knowledge for Development Goals.